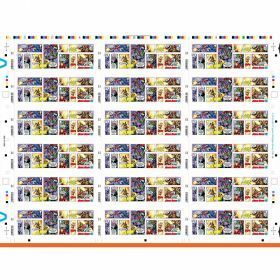 A Miniature Sheet like no other – this set of five bonus Marvel stamps form part of a ten-panel comic book strip in which the Mad Titan,Thanos, launches a deadly attack on the world. This original, never-seen-before story with a unique British twist (look out for Trafalgar Square and the Gherkin!) 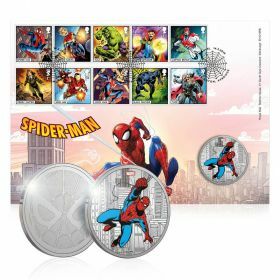 has been specially written and designed by Marvel and is available exclusively through Royal Mail. 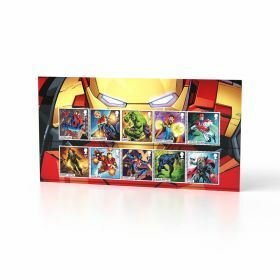 Your Miniature Sheet will arrive presented and protected in a specially designed stamp carrier pack featuring Iron Man on the front and Hulk on the rear. 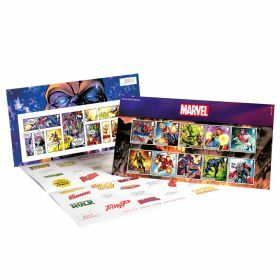 Set of five bonus Marvel stamps form part of a ten-panel comic book strip in which the Mad Titan,Thanos, launches a deadly attack on the world. 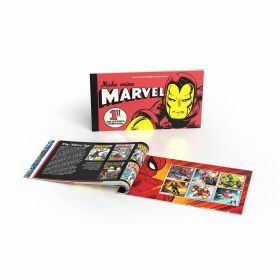 Original, never-seen-before story with a unique British twist - specially written and designed by Marvel and is available exclusively through Royal Mail. 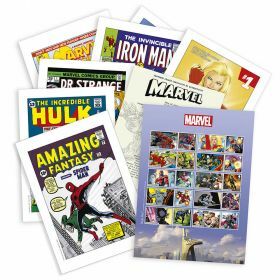 Miniature Sheet will arrive presented and protected in a specially designed stamp carrier pack featuring Iron Man on the front and Hulk on the rear.